Image of the Cavity-backed slot array. Cavity-backed slots allow for very efficient low-loss structures at high frequencies, but often require complex feed structures. By using a single cavity backing for a number of slots and leveraging the modal distribution in the cavity to realise the excitation distribution of the slot array the complexities of the feed structure can be greatly reduced. This approach is used in a number of slot array structures, like the radial line slot array to simplify construction of larger arrays. 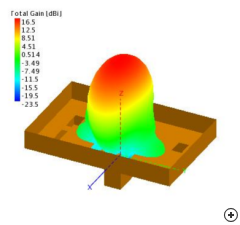 The specific antenna implemented in Antenna Magus is based on a structure developed for satellite digital multimedia broadcasting (DMB) where high-gain as well as high isolation between closely located antennas was required. The 2x4 rectangular slot array provides linearly polarisation with 17 dBi gain over a 10% bandwidth. 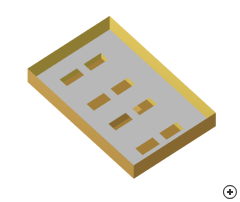 This is an ideal simple-to-construct efficient array and can be used as a building block for larger arrays with minimal inter-element interaction. A 2x4 rectangular slot array with linearly polarisation, 17 dBi gain over a 10% bandwidth.